This post has been sponsored by FoodSaver®. All opinions are my own. Weekday mornings can be a little hectic. I know we aren’t alone in this, and we probably even have it more mild than most, but the reality is that if we have to be somewhere at a certain time, getting the girls up, fed, dressed, and brushed in a timely manner is no small feat. The shortcuts to help with this struggle are fairly obvious. Setting the alarm a few minutes earlier and laying out outfits the night before certainly can help, as can a quick and easy breakfast option. The only negative is that a lot of nutrition can be sacrificed for the sake of convenience. That happening every once in a while? Who cares; enjoy! However, on a day to day basis my kids do better with something a little less sugary and a lot more wholesome. So, as is almost always the case, food prep saves the day. There is a recipe we’ve been eating that is warm (a must for me), hearty, convenient, fast, and comforting. 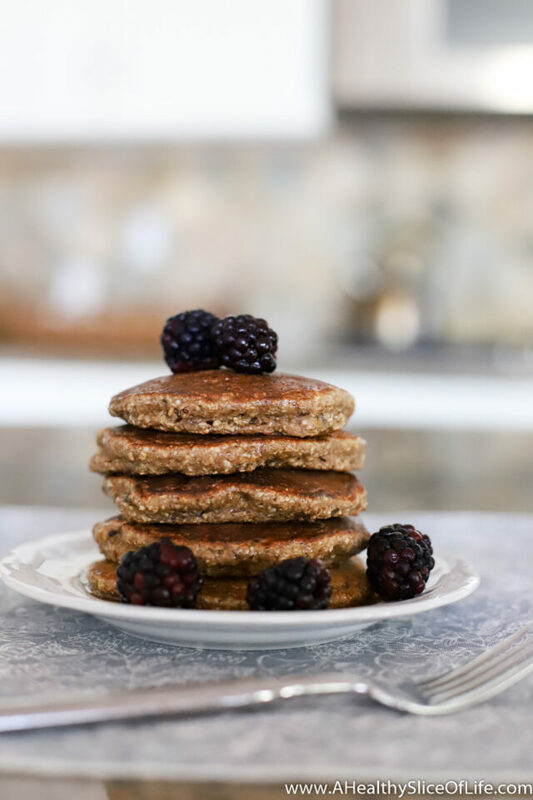 It’s as if a bowl of oatmeal, a muffin, and a pancake all got together and had a baby. Well that just sounds weird, but it’s accurate. They’re perfect. They also happen to be gluten-free and dairy-free if you’re into that sort of thing. And did I mention they take about 2 minutes to reheat once you pop them into the toaster? Two minutes and breakfast is ready. You can certainly smear them in peanut butter or cut them up and serve them with butter and syrup, but they have all the flavor you need baked right in, so you can (and we do) grab them to eat in the car. While this wholesome breakfast only takes two minutes in the morning, they do take a bit longer to make. Nothing excessive, but chopping the walnuts and turning oats into flour isn’t something that is going to happen on an early Tuesday morning. That’s why making a batch of these during my Sunday food prep is a staple. Chop, blend, mix, cook, cool, flash freeze, then vacuum seal. Why vacuum seal? Because nobody wants an unrecognizable, freezer-burned breakfast. 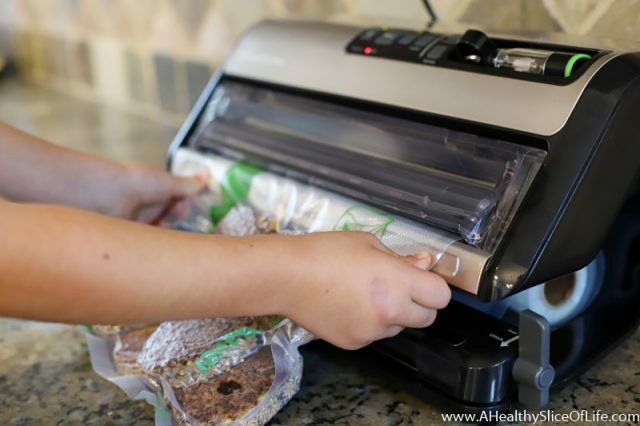 I’ve sung the praises of my FoodSaver and their new model has me doing it again. 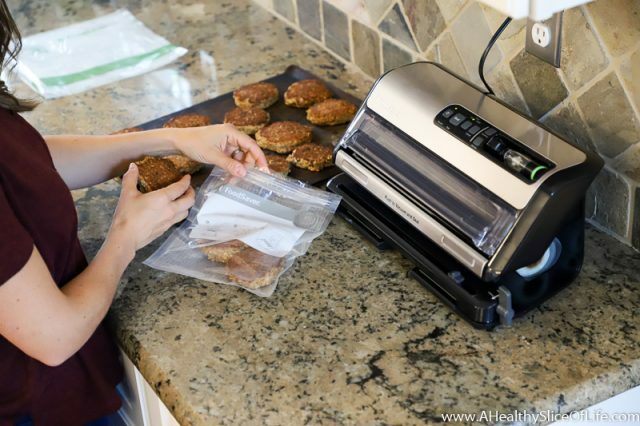 The small, sleek design makes it a counter top staple and it’s new built in accessory feature allows me to use the resealable FoodSaver Vacuum Seal Bags, which are a huge cost saver (some studies show up to $2,700 a year based on buying in bulk and on sale). 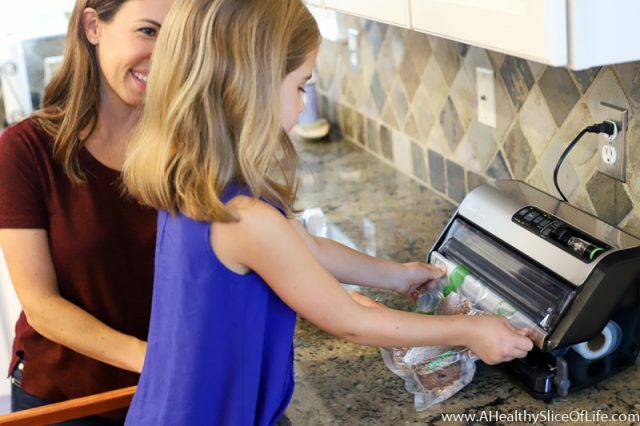 The FoodSaver FM5000 Series 2-in-1 Food Preservation System combats air with an air-tight seal, helping to prevent freezer burn and dehydration in foods stored in the freezer, refrigerator and pantry. It keeps your food fresh up to 5x longer*. You can see specifics on this helpful infograph. *Compared to ordinary storage methods. I’m always grateful for my prep work once the weekday mornings arrive. 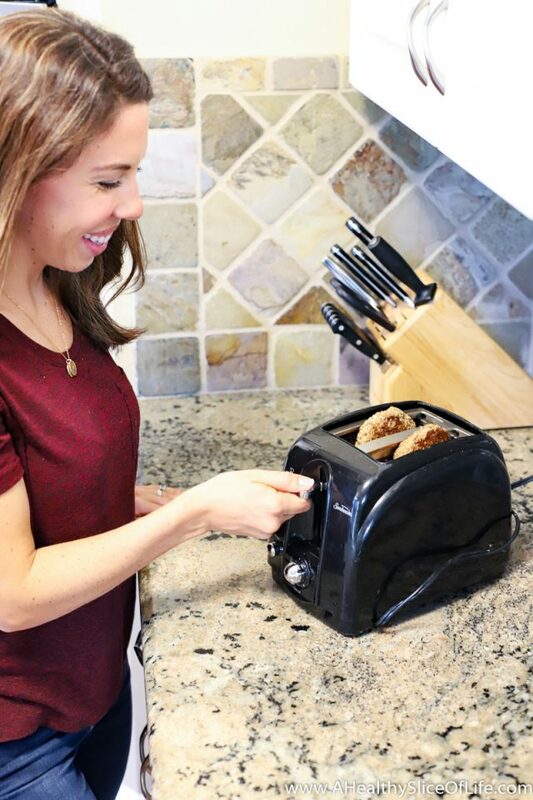 I can pull out our breakfast, pop it in the toaster, and vacuum seal the remaining pop-ups, guaranteeing they will stay fresh and freezer-burn free for as long as we need them to. 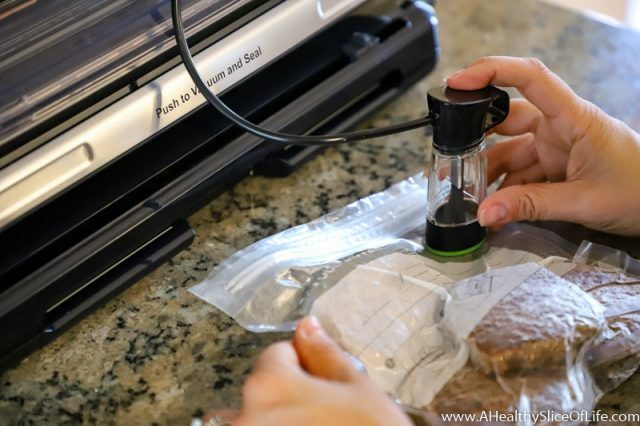 Vacuum sealing extends the life of food tremendously. 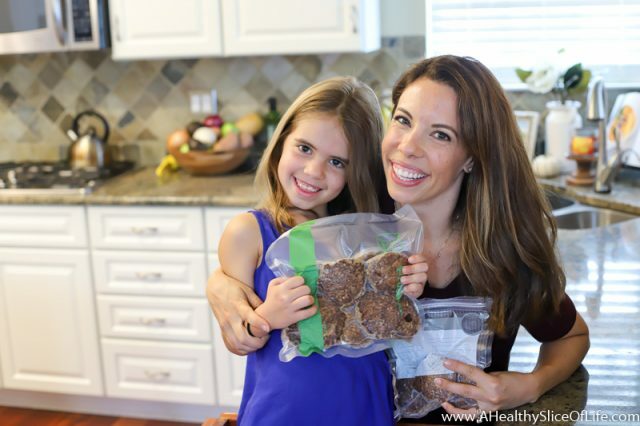 Food prep is such an important part of staying on track with healthy eating, especially when you have a family to feed. FoodSaver® Sundays are helping me save money, reduce food waste, and extend the life of our food. Plus, the girls think it’s pretty fun too! Now go make a batch of these Banana Nut Toaster Pop-Ups for your busy mornings and let me know what you think! 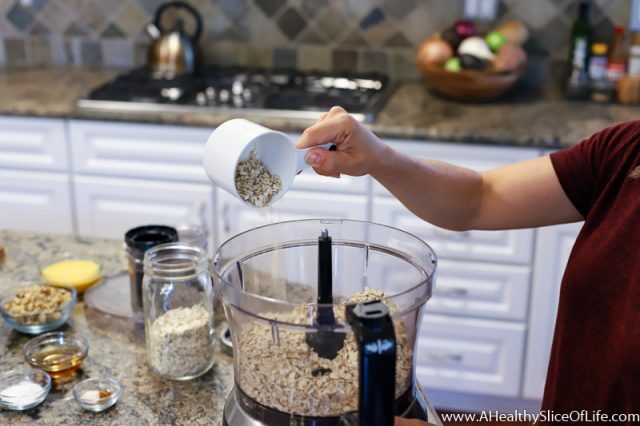 Weekday mornings can be quite hectic, that is when food prep saves the day. This is a recipe we’ve been eating that is warm (a must for me), hearty, convenient, fast, and comforting. 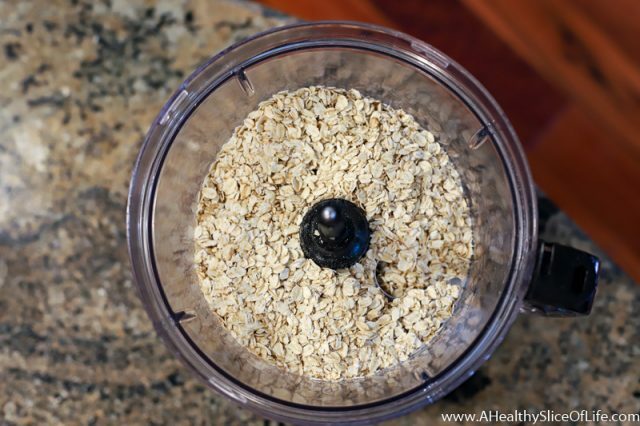 Pour oats into a food processor. Pulse until they turn into the texture of a course flour. 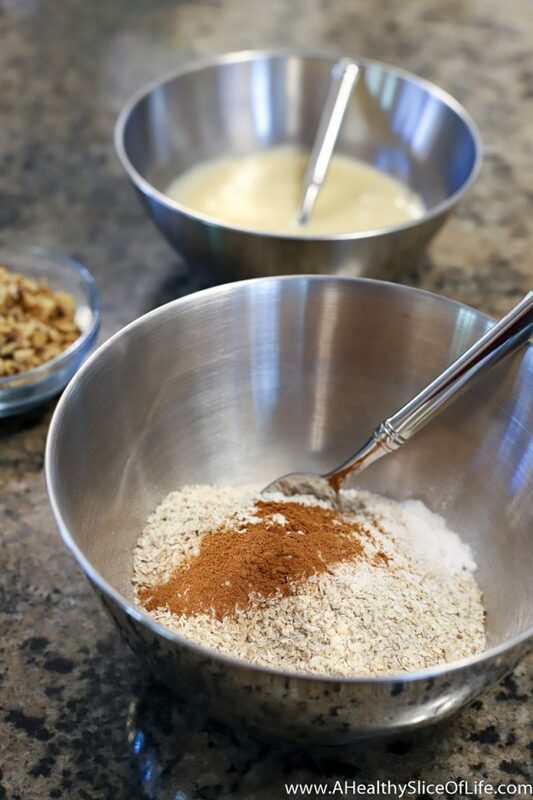 Pour the oat flour into a large mixing bowl. Stir in the baking soda, baking powder, cinnamon, and salt. In a separate mixing bowl, mash the banana until it is a smooth mashed texture. Add the beaten eggs and mix well. Add the milk and maple syrup and mix. 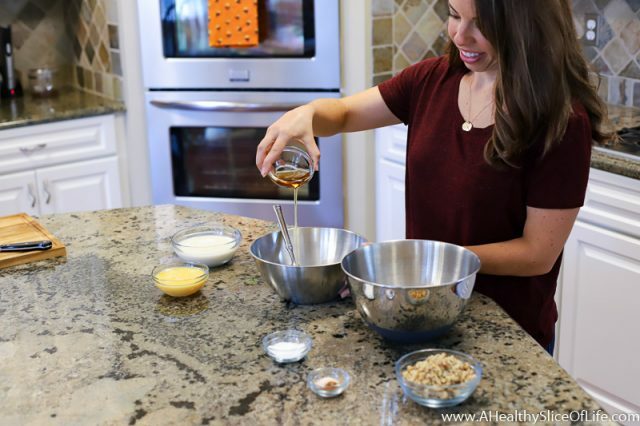 Pour the wet mixture into the bowl of dry ingredients and stir to combine. 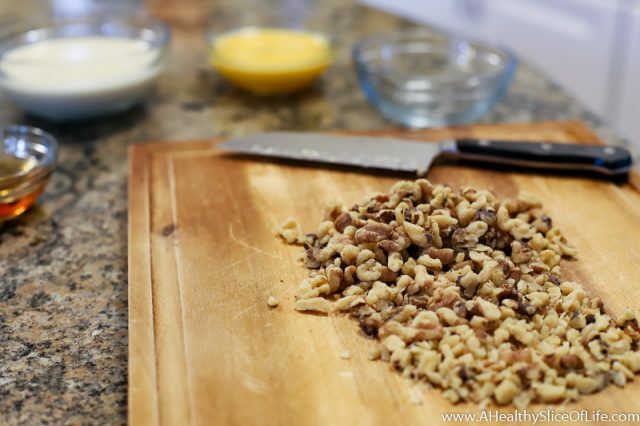 Pour in the chopped walnuts and mix well until fully incorporated. Preheat a griddle to medium heat. Butter the surface (you can use vegan butter or nonstick spray if you prefer to keep it dairy-free). Using a 1/4 cup measuring cup, scoop up the batter and pour it onto the hot griddle. Note: It will be thick and viscous and will not pour as smoothly as a liquid batter. Use the measuring cup to flatten it down into a round shape, roughly 1/2 inch thick. Cook 2-3 minutes on each side until cooked through, then set on a rack to cool. Once cooled, place on a baking sheet in a single layer and place in freezer for 1-2 hours. 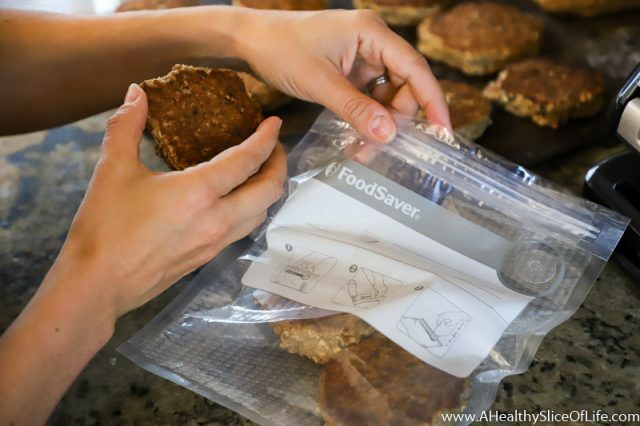 Remove pop-ups, place in a FoodSaver resealable bag, and vacuum seal. Place in freezer for your busy weekday mornings! I made my scones with solid coconut oil instead of butter, which means that these scones are vegan/dairy free. Bonus: it’s much easier to cut coconut oil into the flour than butter. You could swap in other nuts or skip the nuts altogether. I think whole spelt flour would be a fine substitution for the whole wheat flour, too. 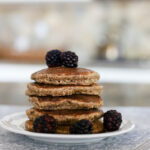 Made these this morning and they were good! I even through in a tablespoon of flaxseed. Got them in the freezer now for future mornings. My wife made them. Tasty. Would like them on a regular basis. A healthy food that actually tastes good! JOHN J STATHAS recently posted..Devoted Spouse: A Local Inspiration! 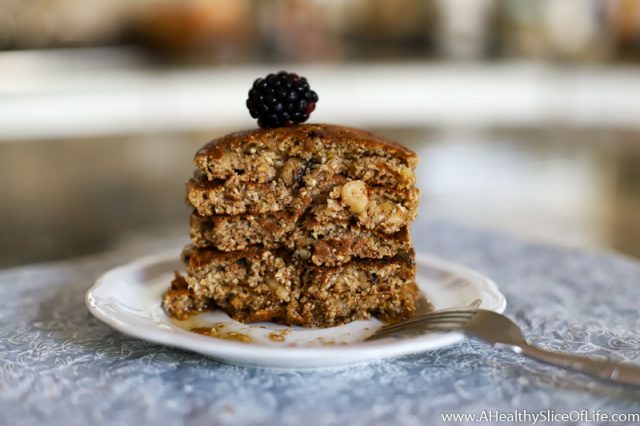 Will it work with store bought oat flour? And if so, how much/ how many cups would you use? 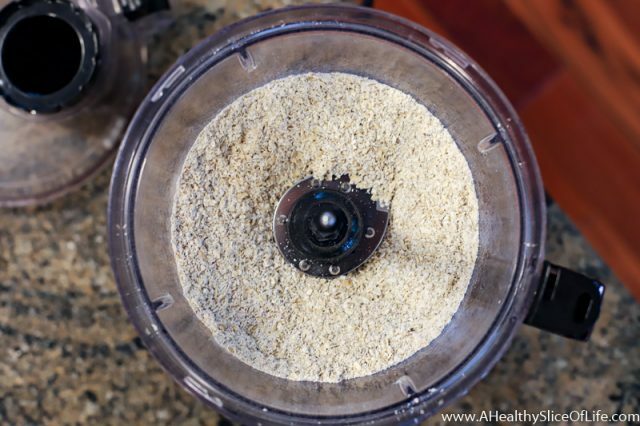 I have not tried it with store-bought oat flour, but I am making another batch tomorrow and will measure the amount of flour I have after processing the oats. Then I will report back! I am also waiting to hear how the oat flour works for you Brittany. I cannot wait to try these! Can you swap out other nuts? My family doesn’t like walnuts. Do you like pecans? Those would work well! I keep meaning to comment and tell you I have made these the past couple of weeks and they have saved me in the mornings! 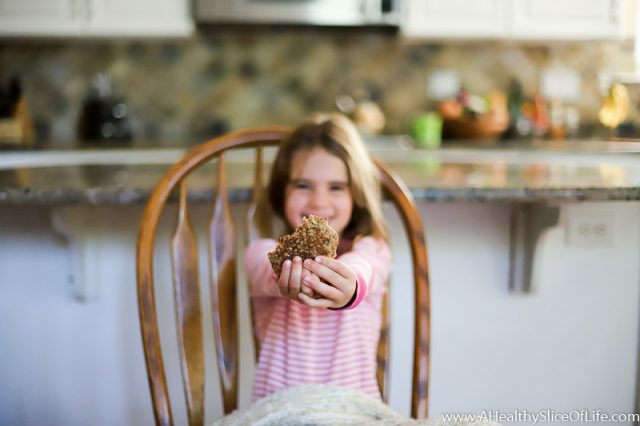 Love the taste and especially love that I’m not giving my daughter (and me) pre-packaged muffins or cereal bars. Thanks for sharing this! P.S. – I’m having your moms spaghetti over zoodles and this has become a weeknight favorite for me. Thanks for sharing that one as well! I made these a couple weeks ago and love them….just today finally had the last one. I plan on making again tomorrow, but wondering why/if they need baking soda and baking powder?? I wanted to come back and thank you for these, I LOVE them. Just about finished eating my frozen stash and about ready to make them again.